I've just updated to Mojave and see immediately there's an issue running Launchbar. I've tried both the light and dark themes and a restart with no effect. I always get the window below. Me too. I didn't see this when running the beta on another system. Also noticed that Safari bookmarks, history and tabs are no longer indexed. +1 for the white circle graphical glitch. Last edited by Hankk2 on Tue Sep 25, 2018 3:27 am, edited 1 time in total. Aha, I figured out the Safari issue. I needed to give LaunchBar full disk access. Click the + then choose LaunchBar. 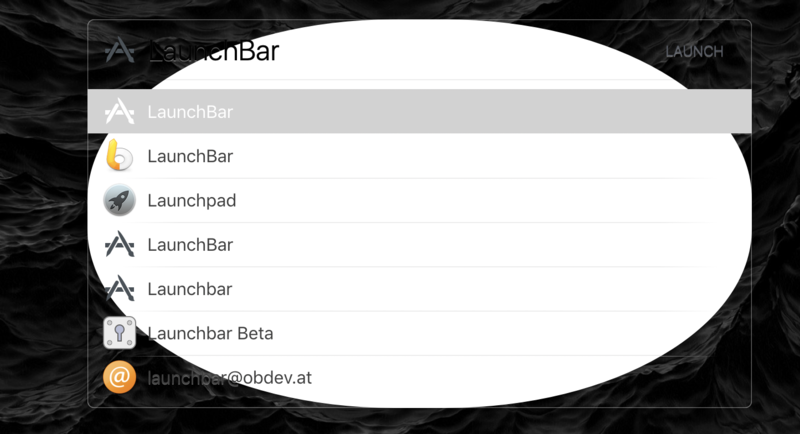 LaunchBar will have to be restarted and then it seems to work! That's better but still has the weird oval visible when the window is launched. The oval issue remains for me too, but with the Disk Access turned on the other Mojave issues seem to be better. To solve the oval thing, toggle System Preferences → Accessibility → Display → Reduce transparency. I get a different result - it work fine with transparency ON (I generally turn it off) and get the oval thingy with it OFF. Toggling it makes no difference other than that. Increasing transparency is a good workaround for now though. Thanks. Thanks. I had to turn 'reduce transparency' OFF — but now my Launchbar menu is semi-transparent, and I want to return to the previously opaque background. Any thoughts on how I might do that? I temporarily switched from the default theme to one with no transparency. Sorry I can’t remember what it’s called. Slate maybe? Sorry for jumping into thread I don't see any way to post NEW TOPIC. I was forced to instal Mojave on my Mac. Afterwards all apple servers were inaccessible. No app store. No safari. No nothin. The geniuses were all baffled. Then I uninstalled little snitch and it all came back. Still got problems though. Can't download from Appstore. I want to delete the other app from you guys. What's it called? It's got a hat icon or something. How can i do this? Microsnitch! How can I uninstall all the components and settings from this app? Also Little Snitch... I used the uninstaller from the DMG but dunno if there's still settings that are screwing up Mojave. Hi there, try this theme, I think I have fixed it. SteveH wrote: I temporarily switched from the default theme to one with no transparency. Sorry I can’t remember what it’s called. Slate maybe?